“No glass allowed.” It’s an all too familiar hurdle for anyone who drinks craft beer on the regular. Whether it be the beach, tailgate or children’s’ birthday party, there are plenty of places where something that could shatter into a million jagged pieces is, understandably, inappropriate. The dilemma then becomes how to enjoy your carefully crafted beverage in a way that will not get you shunned or arrested. Solo cup? That translates to 85% foam. Brown bag it? Still technically illegal. Abstinence? Prohibition’s been over for 80+ years. Thankfully a Philadelphia-based Kickstarter campaign is aiming to increase your options with Aegir, a line of style-specific unbreakable craft beer vessels. While there are plenty of choices out there when it comes to glass and plastic ware, the differentiator is that Aegir has combined the best facets of each to create something new. The goal was to come up with a non-glass vessel that would showcase a beer’s full aroma and taste in a way that would better complement higher quality beverages. The designers behind Aegir took all aspects of the beer drinking experience into account, everything from head formation to carbonation patterns. The theme being that a $10 beer deserves better than a $0.10 cup. After a period of “research, exploration and refinements,” the team settled on PETG copolymer. 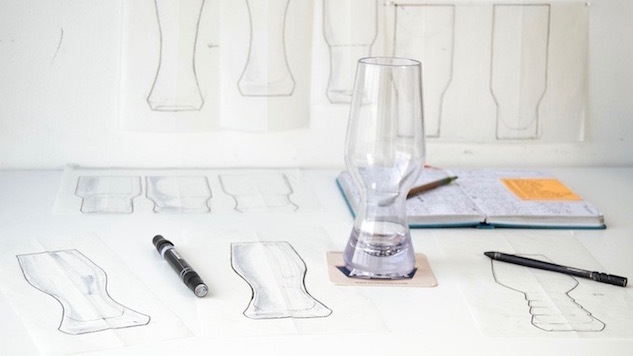 The material allowed for a vessel that could be molded into popular style-specific shapes and still feel like a traditional glass in terms of weight distribution. Plus, it survived a couple rounds with a hammer. The final shapes will be familiar to anyone who has imbibed at a craft beer bar or brewery. The difference being that if you drop this one you only have to find another beer and not a glass. Aegir is rolling out six distinct designs to start: tulip, Weizen, pilsner, IPA, imperial pint and cider. Each is crystal clear, dishwasher safe, freezer safe, food safe and BPA free. In fact, the material has been run through the equivalent of 500 cycles with no degradation in quality or clarity. The campaign to reach $100,000 runs through December 23. Levels of support range from the Official Aegir Guide to Beer ($1) to a set of 24 vessels ($168). They hope to have returns on investment shipped by the end of June. Even if this iteration doesn’t get funded the team plans to push on with the project possibly focusing on one or two of the more popular models and releasing the rest of the line as momentum builds.